Under acidic conditions, an equilibrium is established in about 1 day and consists of approximately equal amounts of the isomers. The partial structures below indicate the two forms of the epimeric pair. The 4-epitetracyclines have been isolated and characterized. They exhibit much less activity than the "natural" isomers, thus accounting for the decreased therapeutic value of aged solutions. The approximate pKa values for each of these groups in the six tetracycline salts in common use are shown (Table 8.7). 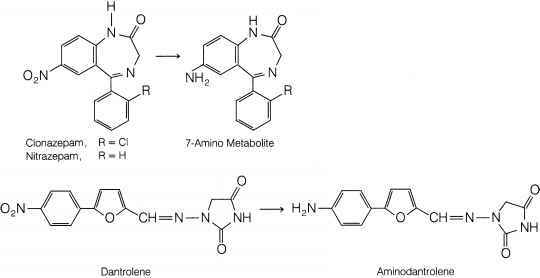 The values are taken from Stephens et al.,151 Benet and Goyan,153 and Barringer et al.154 The pKa of the 7-dimethyl-amino group of minocycline (not listed) is 5.0. 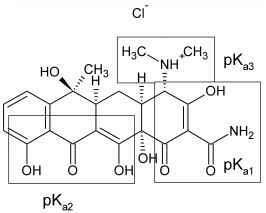 An interesting property of the tetracyclines is their ability to undergo epimerization at C-4 in solutions of intermediate pH range. These isomers are called epitetracyclines. Strong acids and strong bases attack tetracyclines with a hydroxyl group on C-6, causing a loss in activity through modification of the C ring. Strong acids produce dehydration through a reaction involving the 6-hydroxyl group and the 5a-hydrogen. The double bond thus formed between positions 5 a and 6 induces a shift in the position of the double bond between C-11a and C-12 to a position between C-11 and C-11a, forming the more energetically favored resonant system of the naphthalene group found in the inactive anhy-drotetracyclines. Bases promote a reaction between the 6-hydroxyl group and the ketone group at the 11-position, causing the bond between the 11 and 11a atoms to cleave, forming the lactone ring found in the inactive isotetracy-cline. These two unfavorable reactions stimulated research that led to the development of the more stable and longer-acting compounds 6-deoxytetracycline, methacycline, doxycycline, and minocycline.